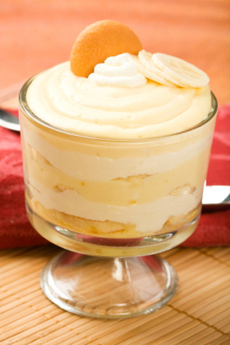 Banana pudding is not only great comfort food; it can be a festive dessert, as well. Photo by M. Sheldrake | IST. This is the best banana pudding we’ve had. Sure, this recipe, developed by a pastry chef, takes a few more steps than making instant vanilla pudding and tossing in bananas and Nilla wafers. But it’s more than worth it! Purée the bananas in food processor. Add the first sugar amount. Place the bananas, Karo syrup, remaining sugar, banana liqueur and the vanilla extract in a small saucepan on medium heat. Cook until the sugar dissolves, stirring as needed. Add in the heavy cream. Bring to a boil. Remove and transfer to a storage container and refrigerate uncovered. Place all ingredients in a double boiler on medium heat. Whisk continuously until the mixture has fully thickened. Transfer to a storage container and place in refrigerator. 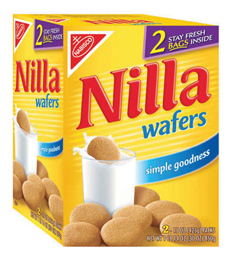 While many people adore Nilla wafers, others dismiss them as “kid stuff,” while others don’t eat HFCS or preservatives. One of our team bakes her own Nilla-style wafers (vanilla cookies) from scratch to use in this recipe. Bring the banana caramel and banana pudding to room temperature. Slice the bananas on the bias, about ½ inch thick. In a separate bowl, mix the banana caramel, pastry cream, sugar, banana liqueur and vanilla extract. Fold the two mixtures together. Add 1/3 of the banana pudding to a serving bowl (or apportion among individual dishes, if you prefer to serve that way). Add half the vanilla wafers. Add 1/3 more of the banana pudding. Add the bananas between the layers. Add the other half of the vanilla wafers. Add the final 1/3 of pudding. Prior to serving, garnish. Top with some crumbled vanilla wafers (or if you prefer, you can rim the bowl with whole wafers). Add dollops of crème fraîche and a drizzle of burnt caramel sauce (recipe).